Neutrophils (polymorphonuclear neutrophils [PMNs]) play an elaborate role in the innate immune response against invading pathogens. Recent research provided evidence that PMNs can play a modulatory role in inflammation next to their primary role of phagocytosis. In the current study, we investigated whether neutrophils can modulate the innate immune response against Candida albicans. 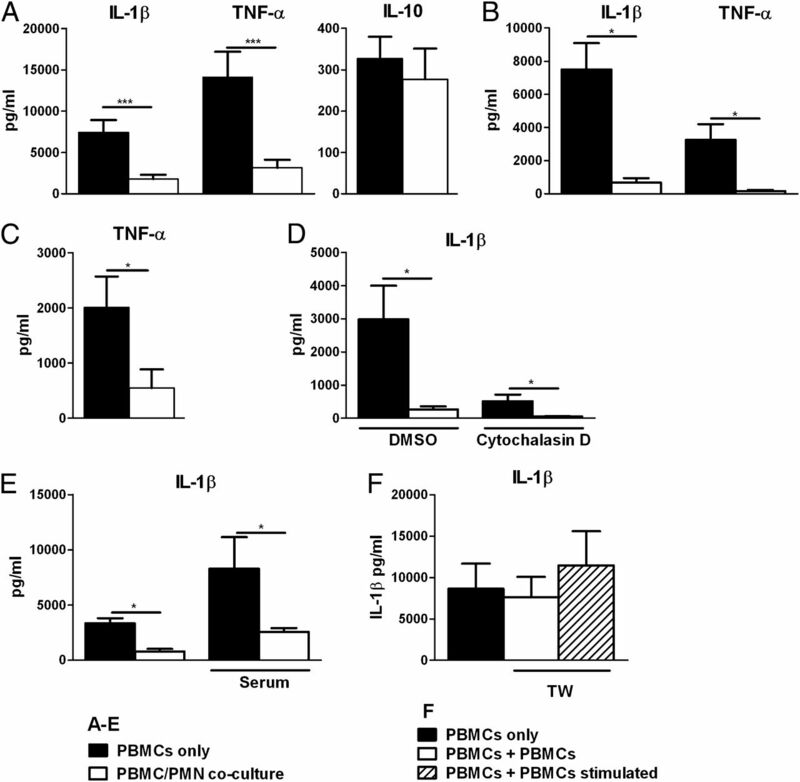 Production of the proinflammatory cytokines IL-1β and TNF-α by human PBMCs in response to C. albicans or LPS was decreased by coculture of PMNs; however, the anti-inflammatory cytokine IL-10 remained unaffected. Using Transwells and cells of patients with chronic granulomatous disease, we show that this downregulation of proinflammatory cytokine production was independent of phagocytosis and reactive oxygen species but was dependent on a soluble factor. We suggest that neutrophil-derived proteases are responsible for the downregulation of IL-1β and TNF-α, as cytokine production could be recovered by addition of α1-antitrypsin, an endogenous inhibitor of serine proteases. PMN lysates and neutrophil elastase could degrade recombinant human IL-1β and TNF-α but not IL-10, and this could be inhibited by addition of α1-antitrypsin. Moreover, we also provide evidence that the dampening effect of PMNs is present in vivo in a murine zymosan-induced arthritis model and a murine experimental endotoxemia model. Altogether, our data show that PMNs can dampen the proinflammatory response to C. albicans by protease-mediated degradation of cytokines. This observation suggest that PMNs might play a important regulatory role in the host defense against C. albicans and can be important for understanding the regulation of inflammation in general. Candida albicans is a fungus that resides as a commensal on the mucosa of the oral cavity, genital tract, and gastrointestinal tract. Under normal conditions Candida is not pathogenic, but suppressed immunity or mucosal damage can lead to local or disseminated infections, the latter being associated with a high mortality (1). Neutrophils (polymorphonuclear neutrophils [PMNs]) play an important role in the host defense against C. albicans, and neutropenia poses a strong risk factor in the development of disseminated candidiasis (2, 3). Neutrophils possess an effective armamentarium against invading microorganisms: they phagocytose invading pathogens and kill these using reactive oxygen species (ROS) and lysosomal enzymes (4). In addition, these cells have a more elaborate role in the innate defense against pathogens. Both in vitro and in vivo studies have shown that neutrophils are capable of Ag presentation by MHC class II complexes (5–7) and are able to express the costimulatory molecules CD80 and CD86 (8), which are relevant for induction of T cell proliferation (5, 7). Activated neutrophils have been shown to secrete cytokines such as IL-1, IL-1Ra, IL-6, IL-8, IL-12, IL-10, TNF-α, IFN-γ, and PGE2 (9–13). Moreover, proteases released by neutrophils can activate precursors of inflammatory cytokines such as pro–IL-1β (14–16) and a variety of receptors (17). Human leukocyte elastase activates TLR4, resulting in an upregulation of IL-8 (18), and triggers the epidermal growth factor receptor (19). Cathepsin G was shown to activate the formyl peptide receptor resulting in the recruitment of leukocytes (20). Recently, we made the observation that neutrophils modulate cytokine production stimulated by bacterial peptidoglycans and LPS (21). As both neutrophils and proinflammatory cytokines are essential in host defense against C. albicans, we investigated whether neutrophils could also modulate cytokines produced by PBMCs after stimulation with Candida. Venous blood samples from healthy controls and patients were obtained after receipt of written informed consent. Four patients with autosomal chronic granulomatous disease (22) provided blood samples; all patients had homozygous mutations in the NCF1 gene (p47-phox), and defective ROS production was demonstrated. Venous blood was drawn into 10-ml EDTA tubes. PBMCs were isolated as previously described (23). Briefly, blood was diluted in PBS (1:1), and fractions were separated by Ficoll (Ficoll-Paque Plus; GE Healthcare, Zeist, The Netherlands) density gradient centrifugation. Cells were washed twice with PBS and resuspended in RPMI+ (RPMI 1640 Dutch modification supplemented with 10 μg/ml gentamicin, 10 mM l-glutamine, and 10 mM pyruvate) (Life Technologies, Invitrogen, Breda, The Netherlands). After density gradient centrifugation and removal of the PBMC fraction, PMNs were isolated from the erythrocyte fraction by hypotonic lysis. To remove erythrocytes, the cell suspension was treated twice with a hypotonic lysis buffer (155 mM NH4Cl, 10 mM KHCO3) during 15-min incubation on ice. Subsequently, PMNs were harvested, washed twice in PBS, and resuspended in RPMI+. PBMCs and PMNs were counted using a particle counter (Beckmann Coulter, Woerden, The Netherlands), and the cell number was adjusted to 5 × 106/ml and 1 × 107/ml for PBMCs and PMNs, respectively. Giemsa staining on cytospins of the cell suspensions assessed purity of the cell populations. The PMN fraction consisted of >95% PMNs, and the PBMC fraction contained <5% PMNs. Viability of the PMNs was assessed by annexin-V and propidium iodide (PI) staining and revealed 1.35 ± 0.49% annexin-V+ PI− cells (early apoptotic) and 0.50 ± 0.120% annexin-V+ PI+ cells (necrotic). PMN lysates were prepared by three cycles of freeze-thawing to lyse the cells followed by centrifugation of 10 min at 12,000 × g to remove cell debris. C. albicans strain ATCC MYA-3573 (UC820) (24, 25) was used in all experiments and grown as previously described (24). In brief, Candida was shaken at 200 rpm overnight at 30°C in Sabouraud broth (1% mycological peptone and 4% glucose), transferred to fresh medium, and incubated for 4 h. The cells were harvested by centrifugation, and the pellets were washed twice in sterile PBS and resuspended to a density of 1 × 108 cells/ml. Candida blastoconidia were heat-killed (HK) at 98°C for 1 h. LPS (from Escherichia coli serotype O55:B5) was purchased from Sigma Chemical (St. Louis, MO), and repurified as previously described (26). Cytochalasin D was purchased from Biomol International (Antwerp, Belgium) and dissolved at a concentration of 5 mg/ml in DMSO. Cytochalasin D was used in a concentration of 1μg/ml. α1-Antitrypsin (Baxter, Utrecht, The Netherlands) was used at a final concentration of 1 mg/ml, and as a control 1 mg/ml human albumin was used (Sanquin, Amsterdam, The Netherlands). Human serum was obtained from a serum pool (n = 84) and was used at a final concentration of 10%. Neutrophil elastase (NE) (27, 28) and the specific NE inhibitor MeOSuc-AAPV-CMK were kindly provided by Prof. J. Schalkwijk (Department of Rheumatology, Radboud University Nijmegen Medical Center) and used at final concentrations of 10 μg/ml and 10 μM, respectively. PBMCs were plated of each donor individually in 24-well plates (Corning, NY) at a final concentration of 2 × 106/ml in a total volume of 500 μl and incubated with culture medium, HK C. albicans blastoconidia at a final concentration of 2 × 106/ml, or LPS at a final concentration of 10 ng/ml, either alone or in coculture with 2 × 106/ml PMNs or a lysate of 2 × 106/ml PMNs of the same donor. In Transwell experiments, PBMCs were plated in 24-well plates at a final concentration of 2 × 106/ml in a total volume of 500 μl and stimulated with medium or HK C. albicans blastoconidia at a final concentration of 2 × 106/ml. Transwells with a permeable polycarbonate membrane with pore diameters of 0.4 μm (Corning) were placed into the wells. In the Transwells, PMNs were added at a final concentration of 2 × 106/ml, either stimulated with medium or HK C. albicans at a final concentration of 2 × 106/ml. Plates were incubated at 37°C and 5% CO2 for 24 h. After incubation, supernatants were collected and stored at −20°C until cytokine measurements were performed. The cell pellet was lysed in an 0.5% Triton-X (Sigma) solution for detection of intracellular membrane-bound TNF-α or in TRIzol reagent (Invitrogen) for RNA isolation. Different concentrations of recombinant human (rh) IL-1β, rhTNF-α (R&D Systems, Minneapolis, MN), and rhIL-10 (Sanquin) ranging from 500 pg/ml to 16 pg/ml, 1000 pg/ml to 31 pg/ml, and 300 pg/ml to 1 pg/ml, respectively, were incubated with addition of medium, PMN lysate of 2 × 106/ml PMNs, or NE (10 μg/ml). PMN lysate and NE were incubated in the presence or absence of α1-antitrypsin (1 mg/ml) for 24 h at 37°C and 5% CO2. Prior to measuring the cytokine recovery by ELISA, α1-antitrypsin (1 mg/ml) was added to all wells to prevent interference of proteases with the ELISA. RNA was isolated using TRIzol reagent (Invitrogen) according to the protocol of the manufacturer. After isolation, the RNA concentration was measured using the Nanodrop (Wilmington, DE). Isolated mRNA (1 μg) was reverse transcribed into cDNA using iScript cDNA synthesis kit (Bio-Rad, Hercules, CA). cDNA quantitative real-time PCR was performed using Power SYBR Green PCR Master Mix (Applied Biosystems, Carlsbad, CA) and the following primers: for housekeeping protein β2M, 5′-ATG AGT ATG CCT GCC GTG TG-3′ (β2M human Forward) and 5′-CCA AAT GCG GCA TCT TCA AAC-3′ (β2M human Reverse); for IL-1β, 5′-GCC CTA AAC AGA TGA AGT GCT C-3′ (human IL-1β Forward) and 5′-GAA CCA GCA TCT TCC TCA G-3′ (human IL-1β Reverse); and for TNF-α, 5′-TGG CCC AGG CAG TCA GA-3′ (TNF-α human Forward) and 5′-GGT TTG CTA CAA CAT GGG CTA CA-3′ (TNF-α human Reverse). All primers were synthesized by Biolegio (Malden, The Netherlands). The PCR was performed with the Applied Biosystems 7300 real-time PCR system using PCR conditions 2 min at 50°C, 10 min at 95°C followed by 40 cycles at 95°C for 15 s and 60°C for 1 min. The RNA levels of IL-1β and TNF-α were corrected for loading concentration differences using the signal of housekeeping protein β2M. Cytokines were measured using commercial available ELISAs (Sanquin, Amsterdam, The Netherlands, and R&D Systems) according to the protocol supplied by the manufacturer. IL-1β, TNF-α, and IL-10 were measured in culture supernatants from 24-h stimulations. 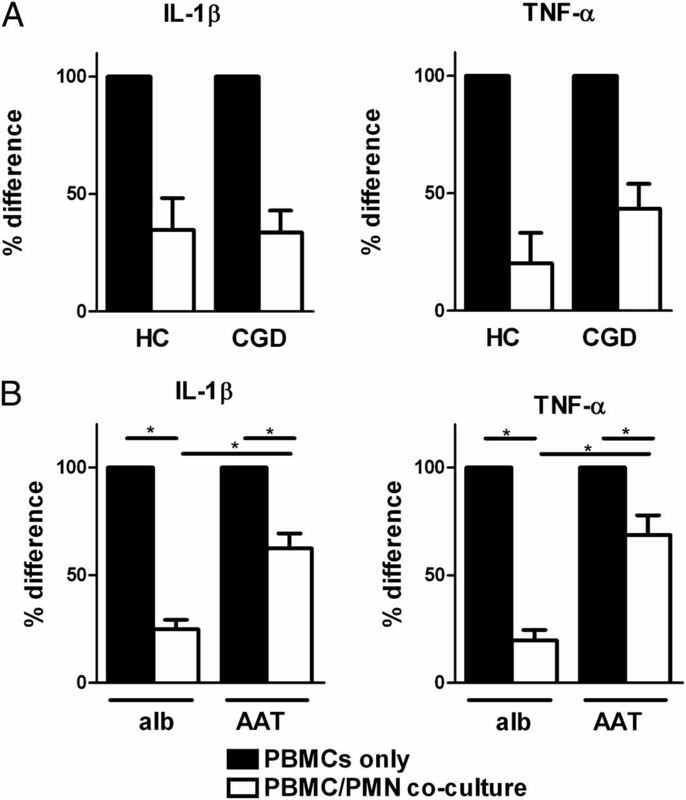 Mouse IL-1β and TNF-α were measured by a radioimmunoassay. NOB-1 cells are a murine cell line that responds to both human or mouse IL-1 by the production of IL-2; furthermore, these cells are unresponsive to other cytokines like TNF, colony stimulating factors, IL-3, IL-5, IL-6, and IFN-γ (29). NOB-1 cells were plated in 96-well flat-bottom plates at a final density of 5 × 105 cells/ml and were stimulated for 24 h using rhIL-1β that was exposed to medium, PMN lysates, or NE in presence or absence of α1-antitrypsin (as described earlier). After 24 h of incubation at 37°C, 5% CO2, the culture supernatants of the NOB-1 cells were collected, and IL-2 production by the NOB-1 cells was measured by ELISA (R&D Systems). Sexually mature female C57bl/6 mice (8–12 wk old, weights 20–25 g) were used. The animals were kept under routine laboratory conditions (21–22°C, relative humidity 60%, and a 12-h light–dark cycle), fed a standard commercial pellet diet (RHM, Hope Farms, The Netherlands), and given acidified tap water ad libitum. The mice were irradiated with 7.5 Gy 4 d prior to the experiment to deplete the mice of PMNs. The protocol for depletion of neutrophils was highly effective, more than 98% of all neutrophils were depleted when the PMNs were measured in the bloodstream. To induce arthritis, 180 μg zymosan (Sigma, St. Louis, MO) in PBS was injected intra-articularly at day 0 into the right knee whereas the left contralateral joint received an equal volume of PBS. The mice were killed by cervical dislocation, and whole patellae were dissected from the right arthritic and left control knee joints, leaving the cartilage fully intact. The patellae were isolated 2 d after the local injection of zymosan from the knee joints with minimal amounts of surrounding tissue. The fully intact cartilage was incubated in RPMI 1640 medium with 1-48 MBq [35S]sulfate (Na235SO4; Du Pont, ’s-Hertogenbosch, The Netherlands) for 3 h at 37°C and then washed three times in physiological saline to remove non-incorporated radiolabel. Patellae were then fixed in 40% buffered formaldehyde and decalcified in 5% formic acid for 3 h and the patellar cartilage removed from the surrounding tissue and digested in Lumasolve (Lumac, Landgraaf, The Netherlands) at 60°C. The quantity of radioactive sulfate incorporated was assayed by liquid scintillation counting (30). The mice were injected i.p. with rat anti-mouse GR1 or isotype control (100 μg in 200 μl PBS) (eBioscience) 4 d prior to the experiment to deplete the mice of PMNs. On day 0, the mice were injected i.p. with 100 μg/ml E. coli LPS. After 2 h, the mice were anesthetized with isoflurane, and blood samples were obtained in 1-ml EDTA tubes for measurement of IL-1β and TNF-α in the plasma. Subsequently, the mice were killed by cervical dislocation. Spleens were harvested, homogenized, and the cell number was adjusted to 1 × 107/ml. The cell suspensions (500 μl /well) were plated in 24-well plates (Corning) and incubated for 48 h at 37°C and 5% CO2. IL-1β and TNF-α were measured by radioimmunoassay in culture supernatants and EDTA plasma. The differences between cytokine concentrations in PBMCs alone and with or without PMN or PMN lysate cocultures were analyzed with the Wilcoxon signed rank test. For comparisons between multiple conditions, the Friedman test and the Wilcoxon signed rank test with Bonferroni correction for multiple testing as posttest were used. Differences between mouse groups were analyzed using the Mann–Whitney U test. A p value <0.05 was considered statistically significant. All experiments were performed at least twice, the data represent cumulative results of all experiments performed, and the number of donors is given as n in all figure legends. The data are presented as mean ± SEM unless otherwise indicated. Data were analyzed using GraphPad Prism v5.0. To investigate the role of PMNs on the innate immune response against C. albicans, PBMCs were exposed to C. albicans blastoconidia either alone or in coculture with PMNs. IL-1β, TNF-α, and IL-10 production of either unstimulated PBMCs, unstimulated PMNs, or PMNs stimulated with C. albicans or LPS was below the detection limit of the assays (data not shown). IL-1β and TNF-α production by PBMCs incubated with C. albicans was significantly reduced when the cells were cocultured with PMNs; IL-10 production remained unaffected under these conditions (Fig. 1A). To rule out the possibility of competition between PMNs and PBMCs in phagocytosis of Candida, we used LPS as a non-phagocytosed stimulus. Similarly to Candida stimulation, LPS-induced IL-1β and TNF-α production by PBMCs was lowered in the presence of PMNs (Fig. 1B) (21). To investigate whether the decreased cytokine concentration could be explained by internalization of the cytokine in the cell or by binding of the cytokine to membrane-bound receptors, we measured the concentration of TNF in the cells lysed in Triton-X, which represents the concentration of intracellular and membrane-bound TNF. The total concentration of intracellular and membrane-bound TNF-α was also reduced after coculture with PMNs (Fig. 1C). PMNs modulate cytokine production induced by C. albicans and LPS. (A) IL-1β, TNF-α, and IL-10 in culture supernatants of human PBMCs (2 × 106/ml) that were stimulated with HK C. albicans blastoconidia (2 × 106/ml) either alone or in coculture with PMNs (2 × 106/ml) (n = 21). (B) A similar stimulation was performed with E. coli LPS (10 ng/ml) (n = 7). (C) Membrane-bound and intracellular TNF-α in/on human PBMCs (2 × 106/ml) that were stimulated with HK C. albicans blastoconidia (2 × 106/ml) either alone or in coculture with PMNs (2 × 106/ml) (n = 6). (D) Cytochalasin D (1 μg/ml) was used to block phagocytosis and receptor internalization in PBMCs (2 × 106/ml) stimulated with 2 × 106/ml HK C. albicans blastoconidia with or without 2 × 106/ml PMNs (n = 6). (E) To supplement the culture with additional nutrients, 10% human serum was added to 2 × 106/ml PBMCs stimulated with 2 × 106/ml HK C. albicans blastoconidia with or without presence of 2 × 106/ml PMNs, and IL-1β was measured (n = 6). (F) PBMCs (2 × 106/ml) were stimulated with HK C. albicans blastoconidia either alone (black bar) or with a Transwell (TW) containing a similar amount of PBMCs (white and hatched bars). The PBMCs in the Transwell were either unstimulated (white bar) or stimulated with HK C. albicans (hatched bar). After 24 h, IL-1β was measured by ELISA (n = 2). *p < 0.05, ***p < 0.001. To explore further whether phagocytosis of C. albicans by PMNs plays a role in the decreased cytokine production, we repeated the experiments in the presence of cytochalasin D, an inhibitor of actin filament polymerization, to block phagocytosis and to block internalization of receptors (31). The addition of cytochalasin D resulted in a decreased IL-1β production by PBMCs stimulated with C. albicans, and coculture of PMNs could further reduce the cytokine production to undetectable levels in the presence of cytochalasin D (Fig. 1D). The observed modulation of cytokine production with PMN coculture could also be due to the presence of increased cell numbers, resulting in decreased nutrients in the culture medium. Therefore, we supplemented the cultures with 10% human serum as a source of nutrients; the lowered IL-1β production with PMN coculture was still present (Fig. 1E). In addition, we performed similar experiments with a double concentration of PBMCs (4 × 106/ml) in the same volume to match the concentration of cells in the PBMC–PMN coculture and tested whether nutritional depletion due to an increased amount of cells was responsible for the observed effects. We did not observe decreased proinflammatory cytokine production in these experiments (data not shown). Furthermore, there was no significant elevation of lactate dehydrogenase levels in the cocultures with PMNs (data not shown), and microscopic examination with trypan blue showed >95% cell survival after 24 h. No free hemoglobin could be detected in the cultures, indicating that the washing steps after erythrocyte lysis were adequate to remove the contents of lysed erythrocytes (data not shown). These observations strongly suggest that the observed inhibition of IL-1β and TNF-α production is not caused by cell death of neutrophils or free hemoglobin. We used a Transwell system to investigate whether the modulation of Candida-induced proinflammatory cytokines by PMNs would rely on direct contact between PMNs and PBMCs. PBMCs stimulated with HK C. albicans were cocultured with PMNs that were separated by a Transwell membrane with an 0.40-μm pore diameter. Coculture with Candida-stimulated PMNs or unstimulated PMNs in Transwells significantly decreased the IL-1β and TNF-α production by PBMCs present in the well below, whereas IL-10 production remained unaffected. When, instead of PMNs, PBMCs were placed in the Transwell, Candida-induced IL-1β production by PBMCs was not reduced (Fig. 1F). These experiments show that the modulation can be present independent of direct contact and suggests that the modulation can be induced by a soluble factor specifically released by PMNs. Therefore, we investigated whether PMN lysate, after removal of cellular debris by centrifugation, was able to decrease proinflammatory cytokine production by PBMC stimulated with C. albicans. The PMN lysates inhibited both IL-1β and TNF-α production but not IL-10 production (Fig. 2B). In contrast, lysates of PBMCs did not show this effect; they rather showed an increase of TNF-α and IL-10 production, although this was not significant (Fig. 2C). However, it must be noted that the reduction of IL-1β and TNF-α concentrations when PMNs were not separated from the PBMCs was significantly more prominent (Fig. 2A), suggesting that in addition to a soluble factor, a contact-dependent mechanism can contribute to the inhibition of proinflammatory cytokine responses. Modulation of cytokine production by a soluble factor released from PMNs. (A) Human PBMCs (2 × 106/ml) were stimulated with 2 × 106/ml HK C. albicans blastoconidia with and without the presence of 2 × 106/ml PMNs either in direct coculture (white bar) or in coculture separated by an 0.4-μm Transwell (TW white and hatched bars). PMNs in the Transwell were either unstimulated (TW, white bar) or stimulated with 2 × 106/ml HK C. albicans (TW, hatched bar); after 24 h of incubation, ELISA measured the production of IL-1β, TNF-α, and IL-10 (n = 7). (B) Human PBMCs (2 × 106/ml) were stimulated with 2 × 106/ml HK C. albicans in the presence or absence of PMN lysate; after 24 h of incubation, IL-1β production was measured (n = 8). (C) Similarly, 2 × 106/ml PBMCs were stimulated with 2 × 106/ml HK C. albicans in the presence or absence of PBMC lysate; after 24 h of incubation, IL-1β production was measured (n = 4). *p < 0.05, **p < 0.01. We investigated whether the modulation of proinflammatory cytokines by PMNs is at the level of transcription. PBMCs were stimulated with HK C. albicans alone or in coculture with PMNs or PMN lysate. IL-1β and TNF-α mRNA levels were similar between culture with PBMCs alone and addition of PMNs (Supplemental Fig. 1A, 1B). IL-1β mRNA expression was also unchanged upon addition of PMN lysate, whereas TNF-α mRNA expression significantly decreased in the presence of PMN lysate (Supplemental Fig. 1A, 1B). After the observation that the modulation of IL-1β and TNF-α by coculture of PMNs is likely to be dependent on a soluble factor, the possible contents of PMNs that could be responsible for the observed effect were systematically addressed. PMNs contain NADPH-oxidase to generate ROS. Others and we have previously demonstrated that ROS can dampen the production of IL-1β by PBMCs (22, 32, 33), therefore we investigated whether the release of ROS by PMNs was involved in the modulation of proinflammatory cytokine production by PBMCs. To test this hypothesis, we used PMNs isolated from patients with chronic granulomatous disease, who have a defect in NADPH oxidase and therefore are not able to produce measurable amounts of ROS (34). PMNs from these patients showed a similar capacity to decrease the production of IL-1β and TNF-α by PBMCs (Fig. 3A). Other possible candidates to decrease cytokine production are the proteases that are stored in the granules of neutrophils. Serine proteases and cathepsin G of neutrophils are inhibited by α1-antitrypsin (35). Incubation with α1-antitrypsin partially recovered the decrease of proinflammatory cytokine in the presence of PMNs (Fig. 3B). Modulation of cytokine production by PMNs is dependent on proteases. (A) IL-1β and TNF-α in culture supernatants of four different experiments with PBMCs (2 × 106/ml) from four different healthy controls (HC) and four patients with chronic granulomatous disease (CGD). (B) Cells were stimulated with 2 × 106/ml HK C. albicans in the presence of α1-antitrypsin (AAT; 1 mg/ml) or in the presence of human albumin (alb; 1 mg/ml) as a control. After 24 h of incubation, IL-1β and TNF-α production was measured (n = 6). Values are shown as percentage of remaining cytokine production in the presence of PMNs, which means that the production by PBMCs alone is set at 100%. *p < 0.05. NE is a protease that is present in the granula of neutrophils. Similar to PMNs, the addition of NE to PBMC cultures significantly reduced Candida-induced IL-1β and TNF-α production (Fig. 4A). This effect of NE was reduced in the presence of α1-antitrypsin (Fig. 4A), and in the presence of the specific elastase inhibitor MeOSuc-AAPV-CMK (Fig. 4B). To elucidate the magnitude of the role of NE in PMN-mediated degradation of IL-1β and TNF-α, we added MeOSuc-AAPV-CMK to PBMC–PMN cocultures. Addition of this inhibitor resulted in partial restoration of the IL-1β levels, but TNF-α levels were not affected (Fig. 4C). Role of NE in reduction of IL-1β and TNF-α by PMNs. 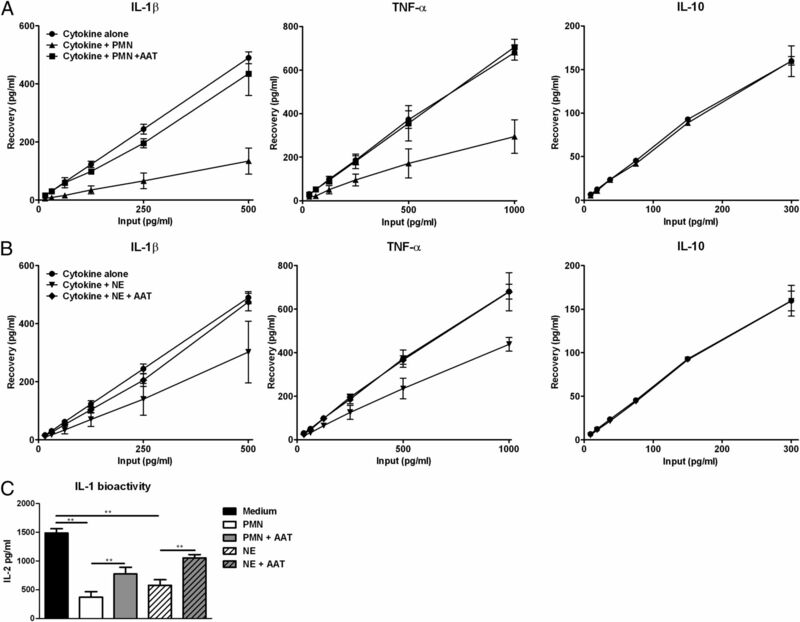 (A) IL-1β and TNF-α levels in culture supernatants of PBMCs stimulated with HK C. albicans in the presence or absence of NE (10 μg/ml) with α1-antitrypsin (AAT; 1 mg/ml) or human albumin (alb; 1 mg/ml) as a control (n = 6). (B) In a similar stimulation, IL-1β and TNF-α concentrations were assessed after addition of the selective elastase inhibitor MeOSuc-AAPV-CMK (NEi; 10 μM) or DMSO as a control. (C) IL-1β and TNF-α levels in culture supernatants of PBMCs stimulated with HK C. albicans with or without PMNs in the presence of MeOSuc-AAPV-CMK (10 μM) or DMSO. Values are shown as percentage of remaining cytokine production in the presence of PMNs; the production of cytokine concentration by PBMCs in response to Candida is set at 100%. *p < 0.05. To determine whether the reduced cytokine levels were the effect of degradation by proteases such as NE, we incubated rhIL-1β, rhTNF-α, and rhIL-10 with PMN lysate or NE. After an incubation of 24 h, PMN lysate resulted in a reduced recovery of both rhIL-1β and rhTNF-α (Fig. 5A). Similarly, NE reduced the recovery of rhIL-1β and rhTNF-α (Fig. 5B). Both the degradation of rhIL-1β and rhTNF-α by PMN lysates and NE could be inhibited in the presence of α1-antitrypsin. In contrast, levels of rhIL-10 did not decrease by addition of either PMN lysate or NE (Fig. 5A, 5B). The use of intact PMNs instead of NE or PMN lysates yielded similar results (data not shown). Using the NOB-1 IL-1 bioassay, we determined whether the IL-1β concentrations that were decreased due to the degradation by proteases also results in reduced biological activity of IL-1β. We found that with proteolytic degradation by either PMN lysates or NE, the biological activity of IL-1 is also reduced (Fig. 5C). Modulation of cytokine production is the result of degradation. (A and B) Different concentrations of rhIL-1β (500 pg/ml to 16 pg/ml), rhTNF-α (1000 pg/ml to 31 pg/ml), and rhIL-10 (300 pg/ml to 1 pg/ml) were incubated for 24 h without any addition or with addition of PMN lysate (A) or NE (B) in the presence or absence of α1-antitrypsin (AAT) to inhibit protease activity. After incubation, the amount of degradation was determined by the detection of these cytokines by ELISA. Values are plotted as mean ± SD of two separate experiments in duplicate. (C) IL-1 bioactivity, determined by IL-2 production of NOB cells, of rhIL-1 (1000 pg/ml) that was exposed to medium, PMN lysate, or NE in the presence or absence of α1-antitrypsin (1 mg/ml). **p < 0.01. To investigate whether our in vitro finding that neutrophils reduce proinflammatory cytokine responses also applies to in vivo circumstances, we tested the modulatory role of neutrophils on proinflammatory cytokine production in a zymosan-induced arthritis model. This model was chosen because PMNs are known to play a large role in arthritis, and the loss of proteoglycan synthesis, which is dependent on proinflammatory cytokines and especially IL-1, represents readout for arthritis severity in this model (36). To deplete PMNs, C57Bl6 mice were irradiated, and 4 d later zymosan was injected intra-articularly into the right joints; the left joints were injected with saline and served as controls. The amount of [35S] incorporation was measured and used as readout for proteoglycan synthesis. Irradiated mice demonstrated a 97% depletion of PMNs. Zymosan injection results in a 48.4% (SD ±8.7%) decrease of proteoglycan synthesis in the nondepleted mice. In the PMN-depleted mice, zymosan decreased the proteoglycan synthesis by 59.4% (SD ±10.6%) (Fig. 6). In vivo PMN depletion results in decreased proteoglycan synthesis. To deplete PMNs, C57BL/6 mice were irradiated with 7.5 Gy 4 d prior to the experiment. Nine irradiated mice and nine control mice were injected intra-articularly with zymosan into the right joints of the hind legs, and the left joints (which served as control) were injected with saline. Chondrocyte proteoglycan synthesis of the cartilage was measured as [35S]sulfate incorporation immediately after isolation of the patellae. The counts of the saline-injected legs were set at 100%. PG, Proteoglycan. *p < 0.05. To investigate the modulatory role of PMNs on the proinflammatory cytokines IL-1β and TNF-α during systemic inflammation, we used a murine endotoxemia model. C57Bl6 mice were injected with anti-GR1 Abs to deplete PMNs or isotype control. Four days later, mice were injected i.p. with LPS or saline, and after 2 h, circulating levels of IL-1β and TNF-α were determined. We also investigated the capacity of the spleens to produce IL-1β and TNF-α in response to the injected LPS. To investigate whether the PMN depletion was successful, peripheral blood was Giemsa stained and microscopically analyzed. Mice that received anti-GR1 showed 90% (SD ±5%) depletion of circulating PMNs (Fig. 7A). Two hours after injection of LPS, the PMN-depleted mice demonstrated significantly higher IL-1β plasma concentrations than non-PMN-depleted mice. Plasma TNF-α was also increased, yet not significantly (Fig. 7B). IL-1β and TNF-α concentrations were below the detection limit in saline-injected mice. 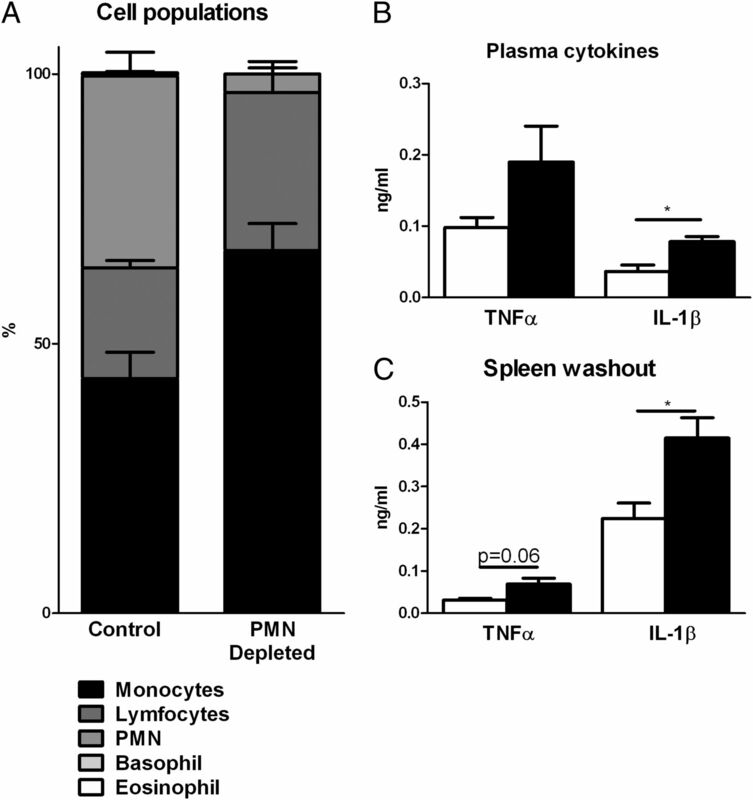 The spleen homogenates isolated from the mice that received LPS demonstrated higher concentrations of IL-1β and TNF-α induction in PMN-depleted mice compared with non-PMN-depleted mice (Fig. 7C). Spleen homogenates of mice that were injected with saline did not show any ex vivo cytokine production (data not shown). In vivo endotoxemia model in PMN-depleted mice. (A) Immune cell populations in blood of control mice and PMN-depleted mice analyzed by microscopy of Giemsa-stained slides. (B) Serum cytokine levels 2 h after LPS injection. (C) Cytokine washouts of spleen homogenates that were harvested 2 h after LPS injection. *p < 0.05. In the current study, we demonstrate that PMNs are able to downregulate the proinflammatory cytokine production of human monocytes induced by C. albicans and E. coli LPS, whereas the anti-inflammatory cytokine IL-10 remains unaffected. This effect was independent of phagocytosis and the production or release of ROS by neutrophils. It was due to a soluble factor released from neutrophils, and α1-antitrypsin reduced the inhibitory effects of neutrophils suggesting that proteases from neutrophils are responsible for the modulatory effects of PMNs. Elastase, a main serine protease present in the granules of neutrophils, was found to be partially responsible for the observed effects. Furthermore, we show that IL-1β and TNF-α levels can be degraded by elastase and neutrophil-derived proteases in PMN lysates. Thus, neutrophils are able to dampen proinflammatory cytokine production from mononuclear cells by the release of proteases, without an effect on the anti-inflammatory cytokine IL-10. We observed in two murine models—a zymosan-induced arthritis model and an endotoxemia model—that the absence of PMNs in vivo results in aggravated arthritis and in increased cytokine levels, suggesting that the neutrophil can play a role in reducing the proinflammatory response both in vitro and in vivo. Because the neutrophil is generally viewed as a proinflammatory cell, our finding that proinflammatory cytokine production of PBMCs in response to Candida in the presence of PMNs is decreased is rather unanticipated. Neutrophils are primarily phagocytes. Therefore, we investigated the possibility that phagocytosis of Candida itself resulting in lower exposure of PBMCs to Candida played a role. By exposing the cells to LPS, a molecule that is not phagocytosed, and by inhibiting phagocytosis with cytochalasin D, we were able demonstrate that the inhibition of proinflammatory cytokine production was not dependent on phagocytosis. It has also been demonstrated that PMNs are able to sequester cytokines (37). Arguing against sequestrations of cytokines as a plausible explanation for our findings is that the concentration of intracellular and membrane-bound TNF-α was also decreased in the presence of PMNs, and blocking internalization of cytokine receptors did not affect the inhibition of cytokine concentrations by PMNs. Furthermore, the observation that lysates of neutrophils and cocultures of PMNs in the Transwell experiments also result in a decrease of proinflammatory cytokine production supports the conclusion that a soluble factor released by PMNs contributes to the reduction of proinflammatory cytokine concentrations. Reduction of proinflammatory cytokines by PMNs in the Transwell system was not as strong as that by PMNs in direct contact. It could be possible that the closer proximity of the PMNs that produce the inhibiting proteases to the monocytes producing IL-1β and TNF-α resulted in a relatively higher concentration of the inhibitors at the site of cytokine production. Still, the stronger inhibition in direct contact could also point to a secondary, contact-dependent mechanism responsible for downregulation of proinflammatory cytokines by PMNs. Apoptotic neutrophils were found to regulate IL-12p40 IL-6 production by IFN-γ–stimulated murine macrophages (38). Neutrophils are most likely entering the early apoptotic phase during 24-h experiments, and therefore this could contribute to the dampening of the proinflammatory cytokine response as suggested by the literature. This might also be an additional explanation why the reduction by PMNs in direct contact is more evident than that in Transwells. Neutrophils generate large amounts of NADPH-dependent ROS, which have previously been demonstrated to have the ability to inhibit IL-1β production (22, 32, 33). However, PMNs from patients with defective NADPH oxidase were still able to reduce cytokine production similarly to controls, suggesting that ROS is not the soluble factor that is responsible for the inhibitory effect of PMNs on proinflammatory cytokines. Notably, the presence of α1-antitrypsin resulted in a recovery of cytokine production. α1-Antitrypsin is most effective in neutralizing NE compared with all other neutrophil-derived serine proteases (39). We were able to demonstrate that NE itself reduces IL-1β and TNF-α production, and a specific NE inhibitor could restore the inhibitory effect of NE on the production of proinflammatory cytokines by PBMCs. Notably, in the cocultures of PBMCs with PMNs, the effect was most prominent on the production of IL-1β. These observations suggest that NE plays a role in the inhibitory effects of PMNs on proinflammatory cytokines produced by PBMCs; however, proteases other than NE that are inhibited by α1-antitrypsin are probably also involved. In addition, it must be noted that the recovery by α1-antitrypsin was partial. This can be explained by the fact that α1-antitrypsin is a reversible inhibitor, or that α1-antitrypsin is sequestered by the PBMCs. However, in the degradation assays, the recovery by α1-antitrypsin was almost complete, suggesting a significant role for proteases in the degradation of proinflammatory cytokines. To elucidate the mechanism through which proteases such as NE modulate cytokine production, we first determined whether modulation was exerted proximally at the level of receptor-induced signaling and/or gene transcription. Notably, transcription of IL-1β and TNF-α in the presence of PMN was not affected. Although we found an effect on transcription of TNF-α with lysates of PMNs, this was not observed when PBMCs were cultured in the presence of intact PMNs. We hypothesized that the effects must therefore be exerted posttranscriptionally, or at the level of processing. Using recombinant cytokines, we show that NE and lysates from neutrophils can exert their effects by cleaving IL-1β and TNF-α extracellularly and can reduce IL-1 bioactivity while leaving IL-10 unaffected. The observation that the degradation of proinflammatory cytokines was completely inhibited by addition of α1-antitrypsin suggests that proteases are responsible for the lower concentrations of IL-1β and TNF. These observations are in line with recent studies reporting that neutrophil serine proteases have a regulatory role during inflammation (40). The degradation of TNF-α by neutrophil-derived proteases is supported by various studies describing that neutrophil-derived proteases, and especially NE, in high concentrations can inactivate TNF-α (41–44). Furthermore, it was shown that pancreatic proteases in a model of acute pancreatitis are also able to inactivate TNF-α (45), and proteinase 3 was found to release membrane-bound TNF-α from alveolar macrophages (46). As an indirect mechanism, NE, cathepsin G, and proteinase 3 (PR3) can degrade CD14 on monocytes, which results in decreased TNF-α levels after stimulation with LPS (47–49). Notably, there are also reports that suggest a proinflammatory role for neutrophil-derived proteases. The release of membrane-bound TNF-α is promoted by PR3, NE, and cathepsin (14, 15, 44). Furthermore, caspase-1–independent activation of pro–IL-1β can be mediated by NE and PR3 (14–16, 50). These findings suggest that proteases released by neutrophils can have proinflammatory as well as anti-inflammatory properties. To see whether the inhibitory role of PMNs has in vivo relevance, we studied the effect of PMN depletion in a local and a systemic murine inflammatory model: zymosan-induced arthritis and endotoxemia, respectively. We observed a significant stronger reduction in proteoglycan synthesis when PMNs were depleted. Because the reduction of proteoglycan synthesis by zymosan is highly dependent on IL-1, this observation is in line with the hypothesis that the presence of PMNs during inflammation results in a lower proinflammatory cytokine production and that in the absence of PMNs, there is more proinflammatory cytokine production (36). In addition, the absence of PMNs during endotoxemia resulted in increased proinflammatory cytokine concentrations in serum and in the spleen. Several reports are in line with our findings. 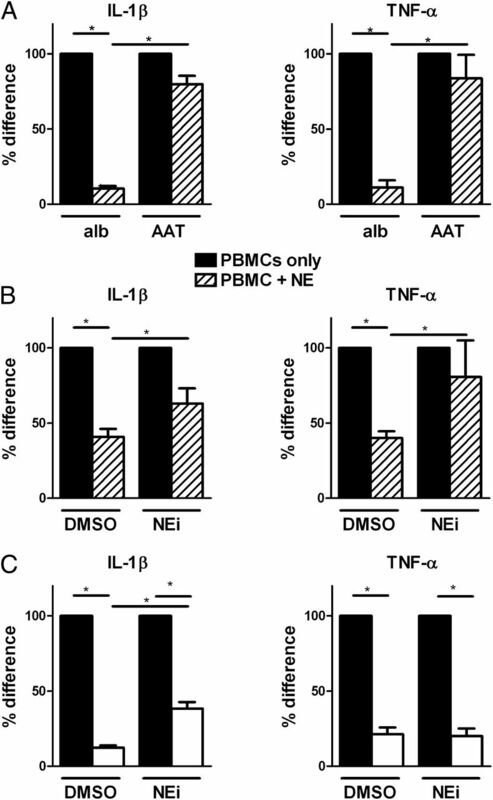 Wound fluids from neutropenic mice were found to contain increased levels of the proinflammatory cytokines IL-6 and TNF-α, but IL-10 was unaffected in their model (51). However, this study suggested that the responsible factor was a molecule of <3000 Da, which is smaller than common PMN-derived proteases. In a previous study, we have shown increased TNF-α and IL-1 levels after LPS challenge in neutropenic mice, which could partly be attributed to increased uric acid levels (52). Moreover, another study demonstrated that coculture of PMNs with PBMCs reduced only TNF-α but not IL-1β in response to LPS (53), albeit 25- to 100-fold more LPS was used in this particular study. The downregulation of IL-1β and TNF-α production by neutrophils in vitro and in vivo may lead to new insights in highly relevant mechanisms, such as the control of inflammatory responses, endotoxin tolerance, and fever in neutropenic patients. Prolonged neutropenia, either primary or that associated with the treatment of hematological disorders, is often accompanied by fever. Patients with neutropenia and fever were shown to have increased plasma levels of IL-1β and TNF-α despite the absence of bacteremia (54). Therefore, it could be possible that the absence of PMNs results in an inability to dampen proinflammatory cytokine production like IL-1, which results in fever. In human experimental endotoxemia, exposure to bacterial endotoxin (LPS) leads to hyporesponsiveness to a new endotoxin challenge (55). It has been described that reduced TNF-α production plays a major role in endotoxin tolerance. Our observation that PMNs are able to downregulate responses to LPS both in vitro and in vivo could potentially be a mechanism of acute endotoxin tolerance. This is partially supported by the observation that a functional heterogenic neutrophil population, accompanied by reduced proinflammatory cytokine production, can be observed after LPS challenge (56). It is currently under investigation whether these mechanisms are similar. In conclusion, we demonstrate that PMNs are capable of downregulating innate immune responses to C. albicans and LPS in vitro by the release of proteases that have the ability to degrade the proinflammatory cytokines IL-1β and TNF-α, while IL-10 is not influenced. This effect is at least partly mediated by NE. This observation suggests that there is a regulatory role for neutrophils and their proteases in the defense against C. albicans, zymosan-induced arthritis, and endotoxemia. However, through this mechanism neutrophils might also play an important role in regulating inflammation and maintaining homeostasis. M.G.N. is supported by a Vici grant of The Netherlands Organization for Scientific Research, and F.L.v.d.V. is supported by a Veni grant of The Netherlands Organization for Scientific Research.
. 2004. Nosocomial bloodstream infections in US hospitals: analysis of 24,179 cases from a prospective nationwide surveillance study. Clin. Infect. Dis. 39: 309–317.
. 1997. The epidemiology of hematogenous candidiasis caused by different Candida species. Clin. Infect. Dis. 24: 1122–1128.
. 2010. Neutrophil function in inflammation and inflammatory diseases. Rheumatology (Oxford) 49: 1618–1631.
. 2008. Murine neutrophils present Class II restricted antigen. Immunol. Lett. 118: 49–54.
. 1993. Induction of MHC class II on human polymorphonuclear neutrophils by granulocyte/macrophage colony-stimulating factor, IFN-gamma, and IL-3. J. Immunol. 151: 1482–1490.
. 2005. Cross-linking of neutrophil CD11b results in rapid cell surface expression of molecules required for antigen presentation and T-cell activation. Immunology 114: 354–368.
. 2003. Synovial fluid neutrophils transcribe and express class II major histocompatibility complex molecules in rheumatoid arthritis. Arthritis Rheum. 48: 2796–2806.
. 2006. TLR2 expression in relation to IL-6 and IL-1beta and their natural regulators production by PMN and PBMC in patients with Lyme disease. Mediators Inflamm. 2006: 32071.
. 2006. Neutrophils and monocytes as potentially important sources of proinflammatory cytokines in diabetes. Clin. Exp. Immunol. 146: 443–447.
. 2010. IL-8, IL-12 and IL-10 cytokines generation by neutrophils, fibroblasts and neutrophils- fibroblasts interaction in psoriasis. Adv. Med. Sci. 55: 254–260.
. 2011. Interferon-γ production by neutrophils during bacterial pneumonia in mice. Am. J. Respir. Crit. Care Med. 183: 1391–1401.
. 1998. Interleukin-13 increases prostaglandin E2 (PGE2) production by normal human polymorphonuclear neutrophils by enhancing cyclooxygenase 2 (COX-2) gene expression. Inflamm. Res. 47: 167–173.
. 1995. In vitro processing of human tumor necrosis factor-alpha. J. Biol. Chem. 270: 23688–23692.
. 1999. Converting enzyme-independent release of tumor necrosis factor alpha and IL-1beta from a stimulated human monocytic cell line in the presence of activated neutrophils or purified proteinase 3. Proc. Natl. Acad. Sci. USA 96: 6261–6266.
. 1999. Interleukin-18 and interleukin-1 beta: two cytokine substrates for ICE (caspase-1). J. Clin. Immunol. 19: 1–11. 2009. Neutrophil-derived serine proteases modulate innate immune responses. Front. Biosci. 14: 3409–3418.
. 2003. Neutrophil elastase up-regulates interleukin-8 via toll-like receptor 4. FEBS Lett. 544: 129–132.
. 2004. Human leukocyte elastase induces keratinocyte proliferation by epidermal growth factor receptor activation. J. Invest. Dermatol. 123: 338–345.
. 2004. Identification of neutrophil granule protein cathepsin G as a novel chemotactic agonist for the G protein-coupled formyl peptide receptor. J. Immunol. 173: 428–436.
. 2009. Modulation of muramyl dipeptide stimulation of cytokine production by blood components. Clin. Exp. Immunol. 156: 428–433.
. 2010. Reactive oxygen species-independent activation of the IL-1beta inflammasome in cells from patients with chronic granulomatous disease. Proc. Natl. Acad. Sci. USA 107: 3030–3033.
. 2003. Aspergillus fumigatus evades immune recognition during germination through loss of toll-like receptor-4-mediated signal transduction. J. Infect. Dis. 188: 320–326.
. 2007. Immune recognition of Candida albicans beta-glucan by dectin-1. J. Infect. Dis. 196: 1565–1571.
. 1969. Interaction of Candida albicans with human leukocytes and serum. J. Bacteriol. 98: 996–1004.
. 1999. Cutting edge: inflammatory signaling by Borrelia burgdorferi lipoproteins is mediated by toll-like receptor 2. J. Immunol. 163: 2382–2386.
. 1996. Constitutive and inducible expression of SKALP/elafin provides anti-elastase defense in human epithelia. J. Clin. Invest. 98: 1389–1399.
. 1990. Skin-derived antileucoproteases (SKALPs): characterization of two new elastase inhibitors from psoriatic epidermis. Br. J. Dermatol. 122: 631–641.
. 1987. A simple sensitive bioassay for interleukin-1 which is unresponsive to 10(3) U/ml of interleukin-2. J. Immunol. Methods 99: 7–11.
. 1985. Hydrogen peroxide suppresses the proteoglycan synthesis of intact articular cartilage. J. Rheumatol. 12: 205–210.
. 1973. Cytochalasin B: effect on lysosomal enzyme release from human leukocytes. Proc. Natl. Acad. Sci. USA 70: 844–848.
. 2008. Superoxide dismutase 1 regulates caspase-1 and endotoxic shock. Nat. Immunol. 9: 866–872.
. 2009. Pathogen-induced interleukin-1beta processing and secretion is regulated by a biphasic redox response. J. Immunol. 183: 1456–1462.
. 1996. Mutations in the X-linked and autosomal recessive forms of chronic granulomatous disease. Blood 87: 1663–1681.
. 1983. Human plasma proteinase inhibitors. Annu. Rev. Biochem. 52: 655–709.
. 1995. Role of interleukin-1, tumor necrosis factor alpha, and interleukin-6 in cartilage proteoglycan metabolism and destruction. Effect of in situ blocking in murine antigen- and zymosan-induced arthritis. Arthritis Rheum. 38: 164–172.
. 2003. IL-1 beta scavenging by the type II IL-1 decoy receptor in human neutrophils. J. Immunol. 170: 5999–6005.
. 2011. Apoptotic neutrophils and nitric oxide regulate cytokine production by IFN-γ-stimulated macrophages. Cytokine 53: 191–195.
. 1980. Kinetics of association of serine proteinases with native and oxidized alpha-1-proteinase inhibitor and alpha-1-antichymotrypsin. J. Biol. Chem. 255: 3931–3934. 2008. Neutrophil serine proteases fine-tune the inflammatory response. Int. J. Biochem. Cell Biol. 40: 1317–1333.
. 1991. Cathepsin-G and leukocyte elastase inactivate human tumor necrosis factor and lymphotoxin. Cell. Immunol. 135: 299–313.
. 1991. Enzymatic degradation of tumor necrosis factor by activated human neutrophils: role of elastase. Life Sci. 49: 1879–1886.
. 1991. Inactivation of recombinant human tumor necrosis factor-alpha by proteolytic enzymes released from stimulated human neutrophils. J. Immunol. 147: 3862–3868.
. 2005. Effects of elastase and cathepsin G on the levels of membrane and soluble TNFalpha. Biol. Chem. 386: 801–811.
. 2005. Degradation and inactivation of plasma tumor necrosis factor-alpha by pancreatic proteases in experimental acute pancreatitis. Pancreatology 5: 37–43, discussion 43.
. 2006. Contribution of TNF-alpha converting enzyme and proteinase-3 to TNF-alpha processing in human alveolar macrophages. Am. J. Respir. Cell Mol. Biol. 34: 219–225.
. 1999. Proteolysis of monocyte CD14 by human leukocyte elastase inhibits lipopolysaccharide-mediated cell activation. J. Clin. Invest. 103: 1039–1046.
. 2000. Human neutrophil cathepsin G down-regulates LPS-mediated monocyte activation through CD14 proteolysis. J. Leukoc. Biol. 68: 209–215.
. 2002. Human proteinase 3 can inhibits LPS-mediated TNF-alpha production through CD14 degradation: lack of influence of antineutrophil cytoplasmic antibodies. Clin. Exp. Immunol. 128: 444–452.
. 1988. Generation of biologically active interleukin-1 beta by proteolytic cleavage of the inactive precursor. J. Biol. Chem. 263: 9437–9442.
. 2005. Modulation of macrophage phenotype by soluble product(s) released from neutrophils. J. Immunol. 174: 2265–2272.
. 1997. The role of hyperuricemia in the increased cytokine production after lipopolysaccharide challenge in neutropenic mice. Blood 89: 577–582.
. 2006. Polymorphonuclear leucocytes selectively produce anti-inflammatory interleukin-1 receptor antagonist and chemokines, but fail to produce pro-inflammatory mediators. Immunology 119: 317–327.
. 1992. Cytokine and acute-phase reactant levels in serum of children with cancer admitted for fever and neutropenia. J. Infect. Dis. 166: 432–436.
. 2009. Development of endotoxin tolerance in humans in vivo. Crit. Care Med. 37: 1261–1267.
. 2010. Functional heterogeneity and differential priming of circulating neutrophils in human experimental endotoxemia. J. Leukoc. Biol. 88: 211–220.